The most dramatic moment in last night’s Italian election came from the second in command in the centre-left PD party.He announced to a room of reporters that voters had staged a “rebellion” and that the country would likely be ungovernable. That “rebellion” was ultimately against outside powers (Angela Merkel, the ECB, the markets even) who have pushed austerity on Italy. And the rebellion took the shape of big support in favour of protest candidates. One weird thing is that it didn’t happen sooner. Specifically: Why didn’t a rebellion vote emerge in Greece last summer, when the economy was much more dire, and the steps being taken were seen as far more draconian? There are a few quick reasons why the dam finally burst. — Last year’s Greek election was clearly cast as a referendum on the eurozone. Voters were told that a vote for left-wing candidate Alexis Tsipras was a vote to leave the euro. Tsipras denied that this was his intention, but that prospect scared off a lot of voters (maybe leaving the euro would have been the right move, but that’s beside the point). Those stakes weren’t really there in this election. — Italy is seen as having been ruled by a puppet for more than a year. Since November 2011, Italy has had an unelected Prime Minister (Mario Monti) that was widely despised for both his austerity and for seen as being a tool of Angela Merkel and the ECB. Democratic countries don’t like puppets. This is a reason for people to get angry. — The screwy voting system. The fact of the matter is that the leftist candidate Bersani (who was the candidate of stability) did win the most votes in both the lower house of parliament and the Senate. To understand the Italian system, imagine if the US elected its government using an electoral college and the popular vote. Normally that works fine, but in a freak year like 2000, that would create chaos. That’s what happened now. The lower house of parliament is based on popular number. The Senate is based on a weird apportionment of seats by region. In this case, the two bodies are clashing. 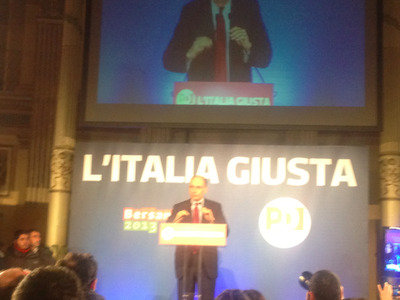 In a more normal system, this might have been seen as a close victory for Bersani (maybe). Bottom line: This was a rejection of outside forces, due to anger at austerity, a lack of stakes over the Eurozone departure, with an odd electoral system thrown in.